Michael, a native of Stratford, Ontario, started playing pipes while at Queen’s University in the early 1980s. Since graduating, he has played in several Toronto-area pipe bands, both military and civilian, competition and street bands. Mike has played in London, Scotland, Norway, and the U.S.A., as well as participating in Queen’s University Bands’ Sesquicentennial cross-country tour. He has played with 400 Squadron Pipes and Drums and the Toronto Scottish Pipes and Drums, as well as street bands. Last summer he was privileged to participate in the Gordon Highlander’s Association “International Beating Retreat” ceremonies in and around Aberdeen, Scotland. Michael is one of the founding members of the TBWA P&D and will forever hold the honour of being the first Pipe Major. Len joined the Black Watch in November 1956, and retired as Commanding Officer in November 1974. He is a member of the Regimental Advisory Board. He was a founding member and piper in the Montreal Black Watch Association Pipes and Drums until moving to Toronto in 1979. From 1980 to present, Len has played with the Highland Creek Pipes and Drums, Allt Gaidhealach Pipes and Drums, Invergarry Pipes and Drums, Toronto Police Pipes and Drums, and the Toronto Scottish Regiment Pipes and Drums. Len has competed at both Grade 3 and 4 levels and was with the Toronto Police Pipes and Drums when they won the Grade 4 North American Championship prior to moving into Grade 3. Len has extensively travelled with various bands to Scotland, Bermuda, London, and San Francisco to name a few. The most memorable was participating as a member of the Toronto Scottish Pipes and Drums in the Scottish Division’s special Tattoo commemorating the Queen Mother’s 100th Birthday. While a member of the 10th Leith Boy Scouts (Edinburgh) John started playing the Bagpipes at the age of eleven and remained with them until 1955 when he joined the Leith Dockers Pipe Band and played with them until 1957 when he immigrated to Canada. At this point he joined the RCAF 401 Squadron Pipes & Drums, playing in many special events such as the opening of the St. Lawrence Seaway. In 1971/72 he joined The Black Watch 3rd Battalion Pipes & Drums and played at events such as the American Bi-centennial in Philadelphia, the Highland Games in Ligoneer Pennsylvania and the 1974 Edinburgh Military Tattoo. In 1978 he was transferred to Toronto and subsequently played with Streetsville Pipes & Drums with a trip to Balmoral Castle Scotland to Play for the Queen. In 2007 he became a member of the Toronto Scottish Pipes & Drums and remained there until 2010. In 2010 he became a member of the Toronto Black Watch Assoc. Pipes & Drums. Jamie suffered from a bad attack of adult-onset piping in his mid-40's and has been weekly suffering through therapy ever since, most recently with the Milligan Memorial Pipe Band in Toronto. Therapy sessions are very addictive, quite productive, very enlightening, but not particularly curative. Jamie has been advised that he is likely to suffer incurably, in perpetuity. Perhaps that is what life is really like. But one should always remember that a bad day on parade is infinitely better than a good day at the office! Jamie has been piping with TBWAP&D since 2012. John started piping at 11 under the careful tutelage of his grandfather, Iain Forbes. As a teenager he played with the Capercallie Pipe Band, in Walkerton, Ont. Following an hiatus through college years in North Bay, John joined the TBWA P&D in 2012. Doug has been piping with TBWAP&D since 2014. Hayden has been piping with TBWAP&D since 2015. Doug began his career in the senior service, (the Royal Canadian Navy), and played with H.M.C.S. Donnacona band in Montreal, beginning in 1960. Doug retired from the pipe band world in the late 60’s but heard the call and chose to jump back in, in 2004 with the Toronto Shriner’s Pipe Band as well as the Kilwinning Pipes and Drums where he occasionally took up the mace as Drum Major. Doug’s career then took him to the Toronto Scottish Regiment Pipes and Drums where he met many of the players he is now with, in the TBWAP&D. Doug briefly left the Toronto Scottish to play with York Regional Police and the Grey & Simcoe Foresters before returning to the Toronto Scottish. Doug currently splits his duties between the TBWA Pipes & Drums and the Toronto Scottish PB. Bianca started snare drumming in 2012 at the Blackdown Army Cadet Summer Training Centre at CFB Borden. Returning from camp she started practicing with the Toronto Black Watch Association Pipes and Drums, joining the Band in 2013. Bianca chose drumming without much thought, but has since then, never let it go. She is one of the first members of the 337 Queen’s York Rangers Cadets Pipes and Drums band and hopes to expand it with the help of the TBWA. Bianca has been in the 337 Queens York Rangers cadet program for four years and has completed the basic military band musician, Intermediate Pipes & Drums Musician, and is on her way to completing the Advanced Pipes & Drums Musician course. Bianca has earned the award for top band member of the 337 Queen’s York Rangers Cadets for the years 2013, 2014 and 2015. Bianca has been recently promoted to the rank of Warrant Officer, 337 Queens Yorks Rangers Cadets. Phil served with the Essex & Kent Scottish Regiment enlisting as a private soldier and was promoted from the ranks attaining a Queen’s Commission. After subsequently serving with 21st and 23 rd Service Battalions, and the 11th Field Artillery, he retired in 1979. Phil has served as Membership Secretary of the Royal Canadian Military Institute, and as a Director of the Hodden Grey Foundation (Toronto Scottish). He is the Treasurer of the Toronto Scottish Regimental Association and a retired member of the Toronto Scottish Regiment Pipes and Drums. After showing a keen interest in embracing her Scottish heritage, Lena played the swing tenor with the Uxbridge Legion Pipes and Drums between the ages of nine and twelve. Although she was born and raised in Ontario, Lena has also spent a number of months living and working in Edinburgh, Scotland. Upon returning to Ontario, she was eager to return to drumming and joined the Toronto Black Watch Association Pipes & Drums in 2013. Mike is another suffering from "adult-onset musician". His curiosity in drumming (and piping) was piqued whilst in Cadets at Central Tech, sometime prior to the turn of the last millenium. It was reinforced by his grandfather, and uncle Charles Spence who played pipes with the 48th Highlanders, and Metro Toronto Police. More recently, he was encouraged to start learning drums by our P/M Michael Maehle during conversations at RCL BR 10 (Todmorden). So, encouraged by his wife, Marilyn Lawson Dickinson (TBWA), Mike has joined our Drum Corps playing the Alto drum. Mike has been drumming with TBWAP&D since 2013. Ryan started playing bass drum with the Queen's University marching band, and while with the Queen's Bands he also was their Drum Major for a year. After leaving university, Ryan joined the Church Street Pipe Band where he continued to hone his craft, before moving on to the Cabbagetown Pipes and Drums. Although he is known as the “big man with the big drum” Ryan has also been known to pick up the side sticks on occasion. Ryan is a founding member of the TBWA P&D. Keith joined The Black Watch Cadets at the age of 11 to learn the pipes. At the age of 13 he moved into the main cadet corps and remained there until the age of 16 when he joined the 3rd Battalion. He served in 3rd Battalion The Black Watch and retired as a WO. He gained tenor drum experience playing with the Clan MacKenzie Pipe Band in Montreal and then as a bass drummer for a short period of time with the St. Laurent Pipe Band. He served as the Treasurer of the Toronto Black Watch Association and was an associate member of the Warrant Officers' and Sergeants' Mess in Montreal. 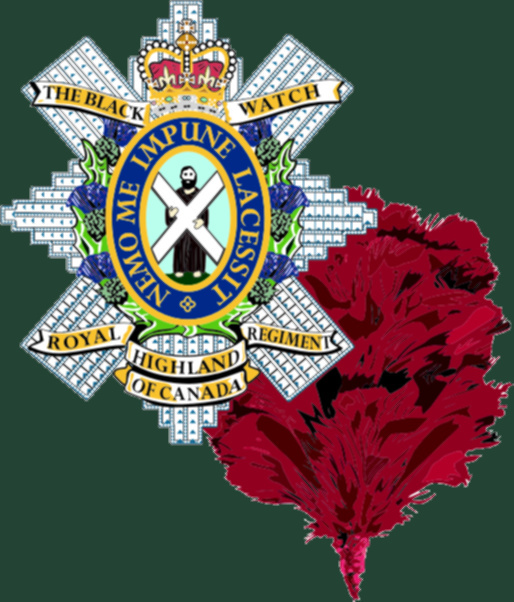 Keith was instrumental in the 2011 Gathering of the Bands in Montreal where all three Black Watch Bands played together along with the cadet band, and toured the Regimental home. The Toronto Black Watch Association Pipes and Drums were deeply saddened by Keith's death in 2013.